What the? 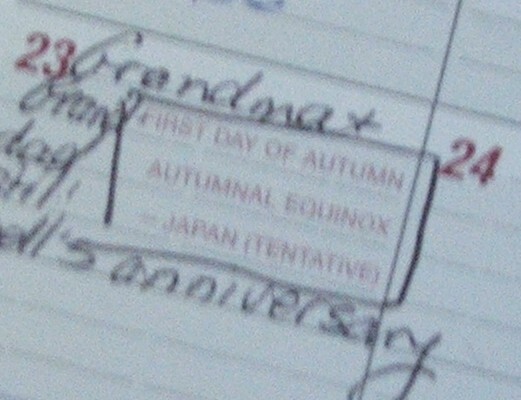 How on earth (or rather how in heaven) could an equinox be only tentatively scheduled? Did it have other plans? Maybe thought it could get away for a long weekend rendezvous with the solstice? But then, like a shooting star flashing across our universe, we realized it would make a fabulous name for a production company and so it was that Tentative Equinox was born. It’s become for us a metaphor for the delicate and tenuous balance of life: dark and light, routine and risk, self and others, work and family. I am Tentative Equinox North, and I write at this blog, (although I prefer the word bjournal). You can find out 100 things about me here, and some other stuff, some of which may be redundant, in the author info on the sidebar. There is a Tentative Equinox South, and she writes here. We currently have no Tentative Equinox West or Tentative Equinox East. Although I warn you the application process is long and arduous, and may or may not include lightning storms (see #53 on 100 things about me) and earthquakes. If you want to reach me, leave a comment. 3 Responses to What’s with the name? I have a 7 yr old daughter who is diagnosed so far with Verbal Apraxia, language processing disorder, sensory seeking, slight hypotonia, and Global Developmental Delay. She is beginning the 1st grade in Tennessee. I am going to another IEP meeting on Sept 14. In this meeting I am going to attempt to get her school to pay for FastForword for her to use at school. I was quoted a price of 3400 by a local SLP and that was just for the first session(8-12 weeks). This is too expensive for us to get it for home use. Do you mind telling me what you are paying in your area. I get the sense that a SLP can basically quote whatever price they want and some are more than others. I really hope this helps with her processing problems. She may have CAPD as well. Her nonverbal IQ was 104 and her verbal IQ was 84. So you can see it is a language based problem. She is very bright, but things just don’t “click”. I would love to hear from you and if you have any tips. Thank You Very Much!! I was so lucky to be able to get my kids enrolled in Fast ForWord because our school district is implementing it district-wide. I don’t know what they’re paying exactly, but the I’m sure it must be in the tens of thousands as we have a large school district. But it doesn’t HAVE to be district wide. It can be purchased by a school too, and that would obviously be cheaper. Then the school can deal directly with SLC rather than a provider. Best to get some advocates on your side who are willing to give it a go. One of the best things to do is pick up the book “The Brain that Changes Itself” by Norman Doidge. Here it is on Amazon. It’s even available in softcover now. Get the principal, the speech pathologist and whoever runs the pursestrings at your school to read Chapter 3. (The whole book if you can, but at a minimum that chapter). Once you have people that are willing to see the whole special education paradigm in a different way, then your job is a heck of a lot easier. But be warned, the education system is a juggernaut that is not easily turned. It will take parents like you and me to insist there have to be alternatives to compensatory techniques. But don’t let yourself believe that Fast ForWord will be the answer to prayers. I mean it may well be, but don’t pin all your hopes on it, and don’t NOT try other things while you wait. If I could summarize the most important thing I’ve learned about the brain in my journey through having kids with brain issues is that they have to practice the thing that they are bad at to get better at it. But, unless they WANT to practice it, it’s no good. So, our challenge is to find ways for them to want to practice and lots of opportunity to do so. That’s why Fast ForWord works–it’s very motivating because it keeps the kids successful and rewards their successes often and immediately. And you have to practice doing it 5 days out of 7 for about an hour. So, you get focused practice and massed practice which is the recipe for brain change. There are some free exercises on their website http://www.brainconnection.com/teasers/ maybe you could start with that. I also have some info I could email you. I have your email address from your original comment, but won’t send anything through unless you tell me it’s okay. You don’t need to put your email address in the body of your comment. If you’d like to do a review of the program please let me know.